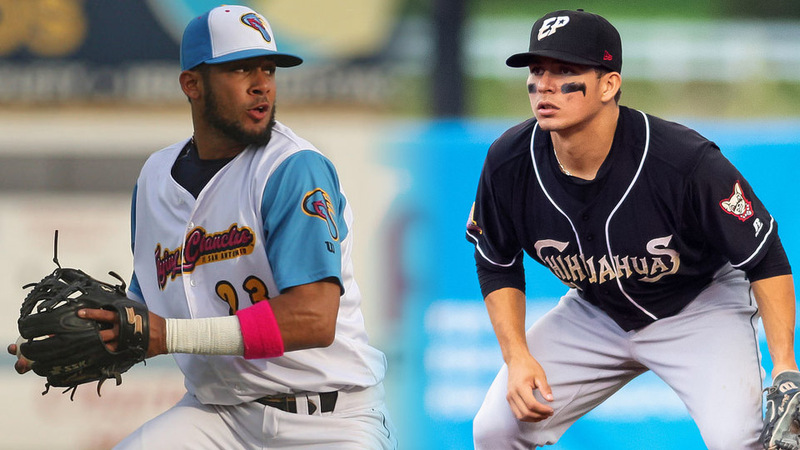 LAS VEGAS -- During their careers in the Padres system, Fernando Tatis Jr. and Luis Urias have only been on the same roster once. The pair of middle infielders teamed up at Double-A San Antonio for about three weeks at the end of the 2017 regular season and for one round of the Texas League playoffs. San Diego manager Andy Green wants them to get used to the idea of being together again, both at Spring Training in the coming months and eventually in the Major Leagues in 2019. "I think both those guys, their minds work," Green said from the Winter Meetings on Wednesday. "They're instinctual. They understand the game. They're going to be great in time. They'll have to earn those opportunities in front of them. Those opportunities are real in front of both those guys." Ranked the No. 2 overall prospect by MLB.com, Tatis is the more exciting of the two -- and perhaps more hyped since he's the one who hasn't yet shown what he can do in the Major Leagues. The 19-year-old shortstop, traded from the White Sox for James Shields in June 2016 before he'd even played a pro game, broke out in his first full season in 2017 when he hit 22 homers and stole 32 bases between Class A Fort Wayne and San Antonio. The hype didn't slow down early in 2018 as he batted .286/.355/.507 with 16 homers and 16 steals in 88 games back in the Texas League. But left-thumb surgery ended his campaign prematurely in July. A month ago, Tatis started playing winter ball back home in the Dominican Republic with Estrellas Orientales and has been no worse for war. He is hitting .265/.383/.485 with three homers (tied for second-most in the league) and six doubles in 20 games. Green said San Diego hitting coach Johnny Washington and field coordinator Chris Kemp have been down to work with the organization's top prospect and others in the organization, himself included, have watched video of his every at-bat. They've all come away impressed. "He's playing short and hitting in the middle of their order every single day," Green said. "It's his hometown team. His dad [Fernando Tatis] is the manager. I'm pretty sure I won't be his favorite manager ever. He's got his dad doing that right now. He's playing well. We're excited he's playing. The playoffs are coming up shortly over there, and we'll continue to be in communication with him and all our winter-ball guys as to when we feel it's best for them to start preparing for the 2019 Major League season. But right now, we feel great about him." That's promising news for the right-handed slugger, given his possible opportunity come Spring Training. The Padres have an opening at shortstop with Freddy Galvis entering free agency this offseason. Service-time issues would likely rule out Tatis from breaking the Opening Day roster, but the healthier and more productive he looks this winter, the more likely it is that San Diego simply pursues a stopgap at short, either in free agency or via trade. Even when Tatis, who turns 20 in January, does arrive from Triple-A El Paso likely sometime in the first half, the Padres seem more than willing to live through his growing pains, especially defensively. "As a 19-year-old or 20-year-old in the big leagues, if that day comes and we move him up at some point in time during the season and he earns that opportunity, there's going to be some of the balls that Freddy caught that we're going to be OK with some of the mistakes that you get from a 20-year-old playing short at the Major League level," Green said. "He's going to make some highlight-reel plays that are a lot of fun." There was a chance Urias -- the No. 27 overall prospect -- was going to beat Tatis to the Major League shortstop gig. The 20-year-old right-handed hitter made his Major League debut on Aug. 28 after showing a solid bat in the Pacific Coast League, where he produced a .296/.398/.447 line in 120 games. His .398 OBP was sixth-best on the Triple-A circuit, despite the fact he was its youngest Opening Day starter. Urias played 12 games as a second baseman with the big club, going 10-for-48 (.208) with two homers, before suffering a pulled left hamstring while running out a ball on Sept. 11. The injury ended his season prematurely and kept him from trying out shortstop -- a position he'd played 110 games at in the Minors -- in The Show for the first time. With that injury scare past, Green admitted Urias' long-term future remains at the keystone. "I was really disappointed when he got hurt last year because he was going to start playing short," said the San Diego skipper. "We brought him and told him, 'We're going to leave you here at second base for 10 to 12 games and get your feet under you. Bounce you over to short for a few games and let you play shortstop in the big leagues.' We don't have any concerns about his ability to do that. But we didn't get a chance to do that because of the hamstring injury. For us, he's a second baseman first and foremost, who has the capacity to move to the left side of the infield and play it relatively well. We do think he's the type of guy [who's a] well above-average defensive second baseman. We cleared some guys off the roster with the understanding that he'd be that for us." Between Urias' ability to reach base and make lots of contact and Tatis' power/speed combo, it's not hard to picture the two of them anchoring not only the middle of the infield but the top of the Padres lineup for years to come. Given their ages and lack of experience, Green admits it may take some time for them to show their true potential. He also admits he can't wait to get them started. "I think everybody's starting to realize the athleticism of the game, the speed of the game," he said. "It used to be guys in their late 30s were being really productive, and we're not seeing that anymore. ... In our case, we've got a couple prospects that are 19 and  that have a really good chance of being in the middle of our infield this year. To expect them to be finished products is a little bit ridiculous. Those guys are really good baseball players, and where we are in the process since I've been here, it has been about development in the Major Leagues. It has been about learning, and we're looking forward to flipping that page and having much more developed guys."